KOLKATA – The City of Joy, and yes of course trams, Durga Pooja Pandals, art, literature, and the very densely populated streets. While the city does retain a lot of the old-world charm, it has considerably adapted itself to the new dynamic and demanding world, giving way to more private vehicles, the trams still snake their way around the city. From Aircrafts, to vehicles on the roads, to ships at the port, the trains and trams and even the hand pulled carts, Kolkata is by-far the only city in the country to have all the modes of transport running. Despite having a high share of public transport system ploughing throughout, Kolkata is congested for reasons such as low share of road networks, poor geometric and huge flow of vehicles in core part of the city. Kolkata “the city of joy” can no longer be considered one when it comes to matters related to traffic system. The city has a high population density making more and more vehicles to run on the streets day in and out. The road space in Kolkata is only 6 per cent as compared to Delhi and Mumbai, which have greater road space. High demand for mobility coupled with low road space leads to high congestion on the roads of Kolkata. Some busy or Traffic Choke points in Kolkata are Park Circus, Dum-Dum, South City mall etc., where during rush hour, traffic crawls at an average speed of 14 to 18 Kmph, however, on the other hand, at places like maha-maya flyover, saltlake etc, the haphazard movement of over-speeding vehicles called for something to monitor and regulate the traffic of the city. 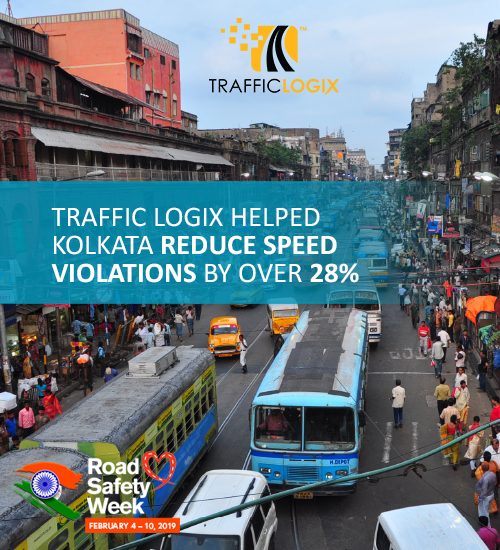 With the introduction of Traffic Logix SafePace Radar Signs and The Enforcement Logix Enforcer Speed Cameras, there has been a significant improvement in the traffic movement health and have resulted in calming the traffic movement at premier locations across the city.